Did you stockpile orange pumpkins in October? I bet you aren’t going to carve all of them, so if there are any leftovers please don’t throw them out! With a little spray paint you can take plain orange pumpkins and transform them into elegant pumpkins that will be great with your Thanksgiving decor. These were super easy to make. I was in Pier 1 the other day and saw this pillow. It got me thinking about some of the Styled by Tori pendant pieces I still had from this post. It also got me thinking about ALL of the real pumpkins I still had sitting around from Halloween. During the months of September and October it seems like I pick up a pumpkin or 3 every time I’m at the store. As a result, I have a zillion orange pumpkins still sitting here come November 1st. Which is fine and all, except for the fact that this year they do not go with my Thanksgiving dinner color scheme of white, taupe and green…. This was the next logical step. (For me, any way.) And it was super easy. 2. Spray the pumpkins and wait for them to dry. Grab some green acrylic paint and a small paintbrush. 3. Paint little stripes of green paint down the sides of the pumpkin. 4. Working quickly, dip a wider brush in a little water and brush over the green stripes. 5. Add a bit of pearlized paint and brush over the watered down green. 6. 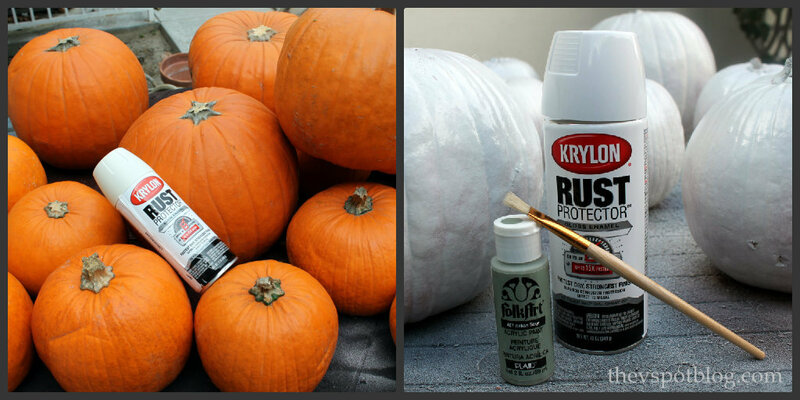 Spray the pumpkins with a clear gloss sealant. 7. Gather your bling, some floral pins and some ribbon. 8. 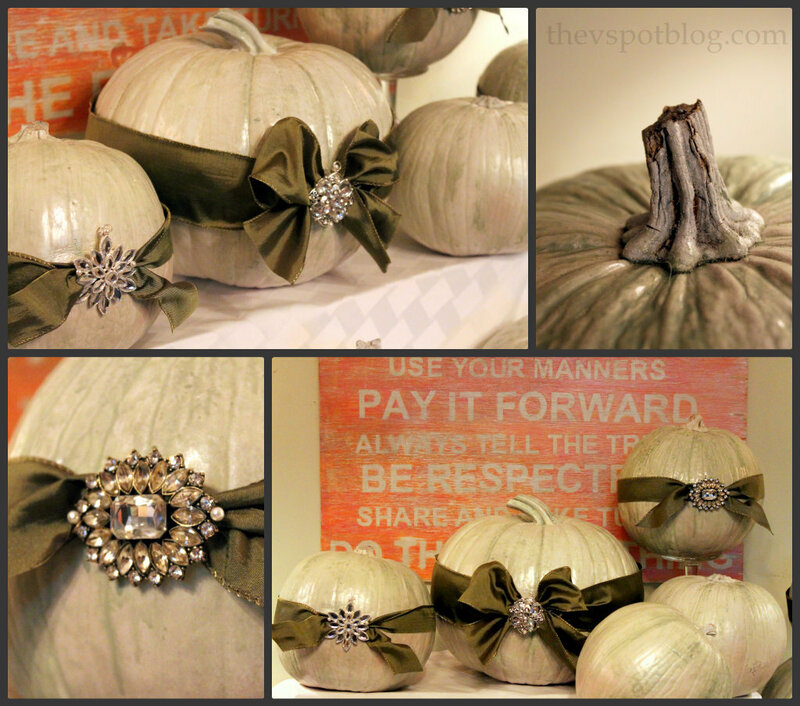 Cut ribbon to length, wrap around pumpkin and either tie a bow or secure with floral pins. 9. 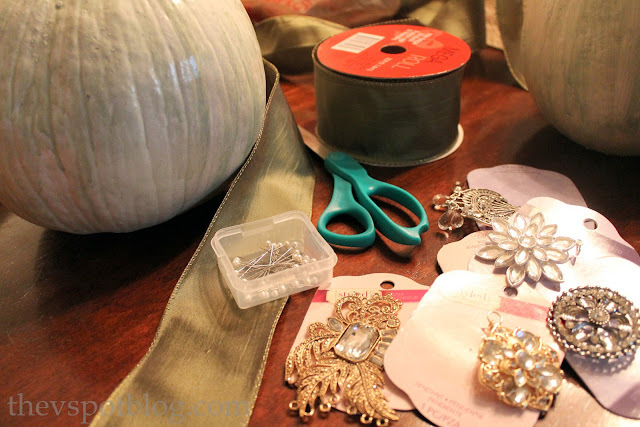 Use floral pins to secure the pendant to the pumpkin. And after Thanksgiving (but before the Christmas decorations come out) I will take these same pumpkins and give them this epsom salt and glitter treatment. Gorgeous! I love repurposing AND how simple this project was! They really are beautiful. The silky bows and bling make them gorgeous!! You are definitely getting your money’s worth on those pumpkins! Beautiful! Simple but beautiful! I love the color you choose for the pumpkins! Happy Thanksgiving! Absolutely brilliant! Cool technique and I lobe the finished product! super swanky pumpkins! 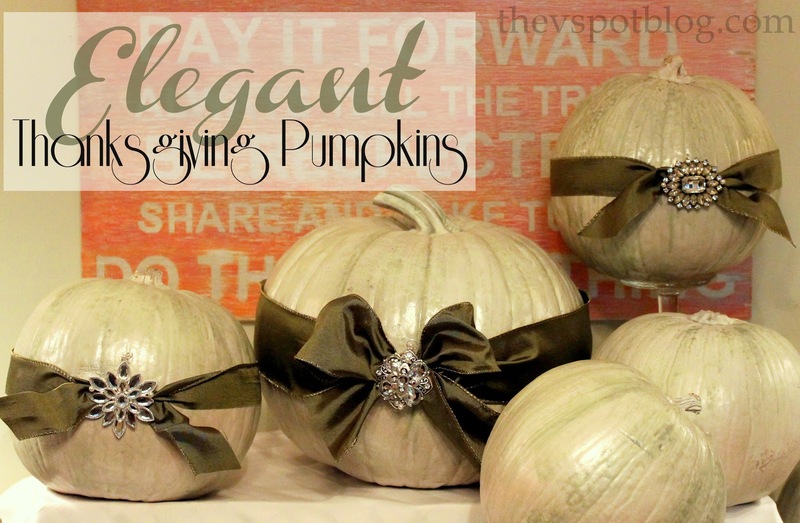 Love that you are upcycling your pumpkins! Since we don’t get any trick or treaters on our road haven’t bought any real pumpkins since we ,moved here in 2006. Your pumpkins are gorgeous and so smart to continue getting good use from them. and what snazzy redo’s, wow. You put your imagination to good use also finding pretty ways to continue using pumpkins. You’ll have gorgeous centerpieces and decorations for .Thanksgiving. We go to our daughters for Thanksgiving since we don’t have a dining area or table/ chairs any more. It’s just us two mid 70’s seniors and they have bigger house. We have a single wide mfg. home. 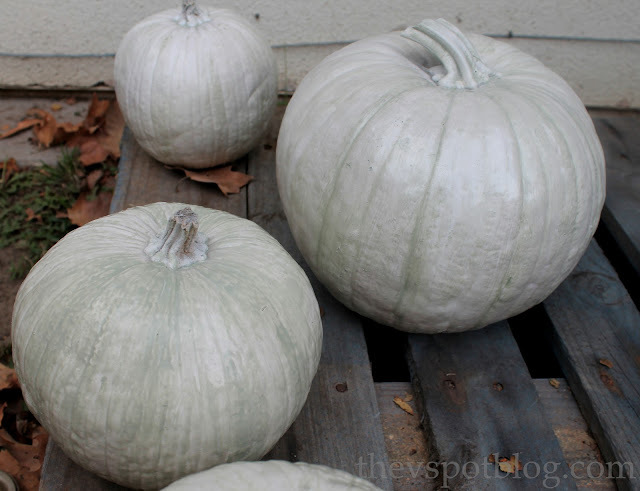 Loved how you painted pumpkins with green first then overlaid the white, great look. Ι like looking throսgһ a post that will make men and women think. Also, many thanks for aⅼlowing fⲟr me to comment!